We received a question about our Energy Body Cream recipe that is on our site. The question is how to reduce the viscosity of this cream. Let’s figure our the percentages of each of these ingredients first. These percentages have been rounded a bit for easier calculating. 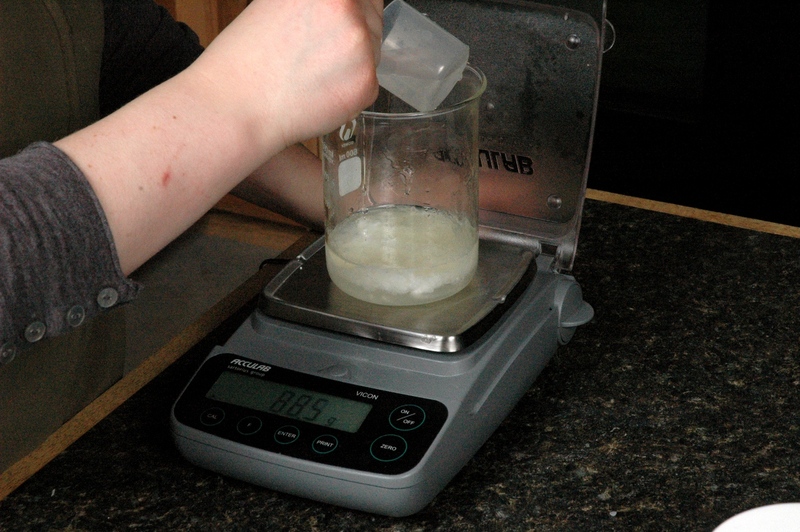 To reduce viscosity the Stearic Acid, Cocoa Butter, and Emulsifying Wax all contribute to an increased viscosity. Reducing the Stearic Acid to 3 grams will decrease the viscosity just a tad. Removing the Cocoa Butter will decrease the viscosity a bit more. 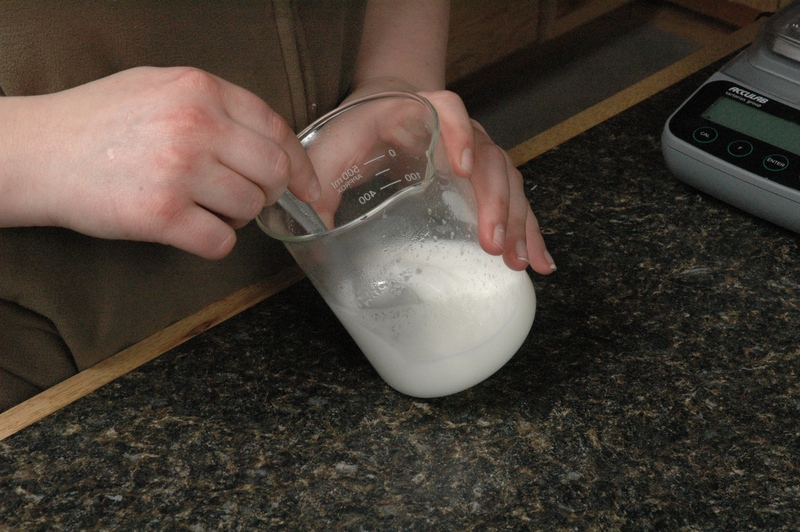 Removing the Stearic Acid will decrease the viscosity by a lot more, and removing both will decrease the viscosity significantly. Sometimes we replace ingredients like these with other materials that help make a creamier product with a lighter feel, this helps reduce viscosity and help lighten the overall feel. I would probably make the Stearic Acid 2 grams, increase the Colorless Jojoba to 8 grams, and replace the Cocoa Butter with Isopropyl Myristate. To make the lotion have less drag, replacing the Glycerin with Hydrovance will also reduce drag and make a lighter feel, without changing viscosity much. This gives lots of options for change. It certainly will make a difference, based your desired final product, by which option you choose. As always, you can change a recipe to suit the ingredients you have on hand. I only had White Cocoa Butter on my workbench, so I used that instead of the Regular Cocoa Butter that the recipe called for. Even with this change, the recipe turned out fine. 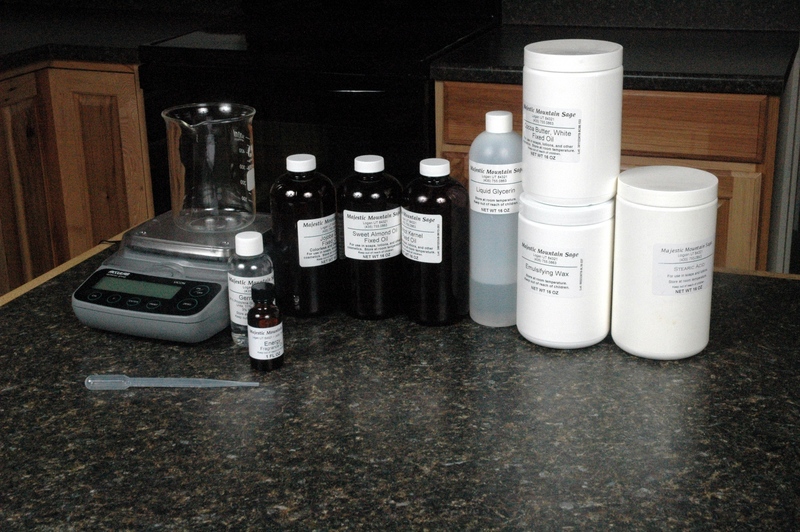 Weigh all ingredients except Germaben II and Energy Fragrance Oil. Melt the ingredient in the microwave using short bursts of time. It took about 1-1/2 minutes in my microwave to melt the ingredients. Once the ingredients are melted, stir to thoroughly mix. Allow the ingredients to cool until the cream has reached approximately 100 degrees Fahrenheit. Now you can add the Germaben II and Energy Fragrance Oil and mix well. Pour the cream into jars and cap the jars. Now you have a quick and easy cream ready to use for an energetic pick-me-up. Weigh ingredients except for fragrance and Germaben II. Stirring melted ingredients with a spoon. Stirring melted ingredients after adding fragrance oil and Germaben II. 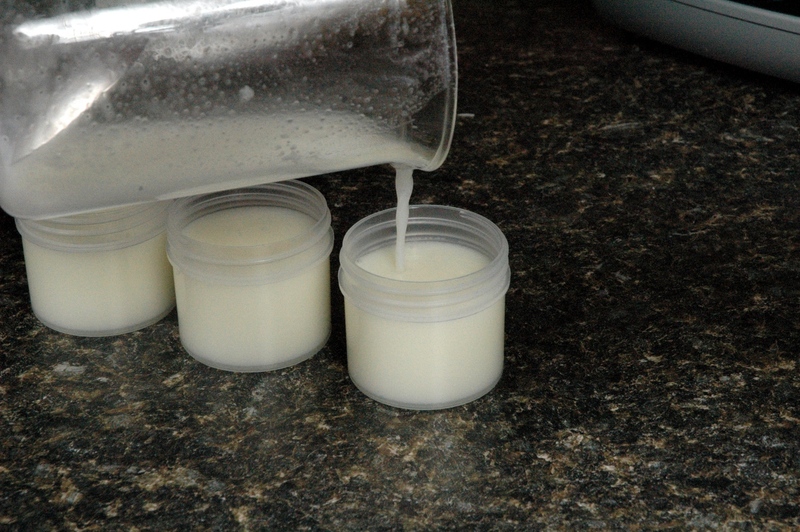 Pouring finished cream into jars. 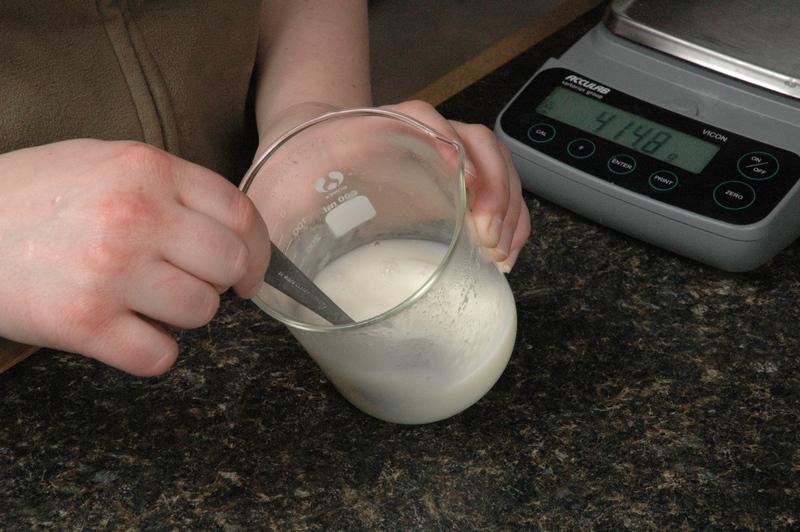 This recipe makes about 5-1/2 ounces of cream, so if you want to make more cream, use the percentages that we calculated and choose how much cream you want to make. Once you have decided, multiply that amount by the percentage. 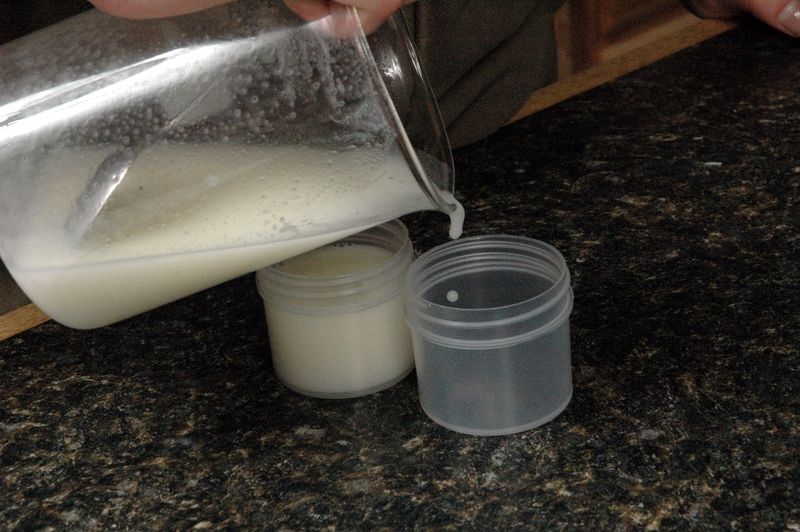 For example, I want to make enough cream to fill 8 of the 4 oz Clear PET Low Profile Jars, Size 70. I would need approximately 32 ounces of cream to fill up the jars a little past the shoulder of the jar. I can either calculate this recipe in ounces or I can calculate it in grams. I’m going to show both calculations. Next week I’m going to show embedding objects in Melt & Pour Soap! I am trying to add lotion to my learning and I wanted to know if you have a basic cream recipe I could build from. Would this one work? Or is there a more basic one you suggest to build from? Also what is the difference between a cream and butter? I’m not entirely sure. A cream is generally a fluid mixture that has more oil than water, or a larger percentage of oil. It is generally more viscous than lotion and generally comes in a jar. Notice I say generally. This is a rule that can be broken and certainly everyone has used a thickened lotion a time or two and would confuse it with a cream. So, viscosity is not a determining factor of whether a cream or lotion, it is oil content. But in general terms we can talk about a jar product and a bottle product as being cream or a lotion. This recipe is as good as any to start. The key to doing lotions is your notebook. If you keep fantastic notes you will be an excellent lotion maker in no time! I had a quick question. I know with soap you can add Hydrogenated Soybean Oil to soaps to cut down cost but could you to the same for creams and lotions? Could, but this is where the feel of the oil comes into play. Cheap doesn’t always feel good. In soap (it is a wash off product) it is different than lotion (a leave on product). what is the shelf-life on this before it goes bad? I would expect about 1 year. Storage conditions will vary the expectations.